Tennessee Williams is one of my favorite playwrights, and all I ask of a production of one of his plays is that it leave me with that feeling of delicious melancholy. 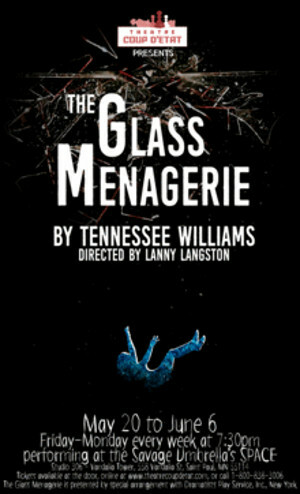 Theatre Coup d'Etat's production of The Glass Menagerie, my favorite Williams play, did just that. As I drove home last night and saw the big moon hanging heavy in the sky, I sighed and made a wish for something that would never come true. Just like the characters in Menagerie, Williams most personal play. Theatre Coup d'Etat's interesting staging with appropriate mood lighting and music really makes it feel like you're looking in on Tom's (aka Williams') memories of his family. Which is always a beautifully tragic rumination on the past, how memory works, and how the choices we've made continue to affect us. The play is staged Savage Umbrella's SPACE, a studio space in an artists' warehouse building off University in St. Paul. It looks very different from last time I was there, for Coup d'Etat's Equus. The Wingfield's apartment is set inside a square three-walled room, with the audience looking in from the fourth side. While at times acoustically challenging, this creates an effect of being an observer peering into their lives, almost like a life-sized dollhouse. The shabby furnishings, soft lighting (the candlelight is especially effective), and appropriately melancholy music all set the tone for the story (set design by Meagan Kedrowski, lighting design by Mark Kieffer, and sound design by Lanny Langston, who also directs). 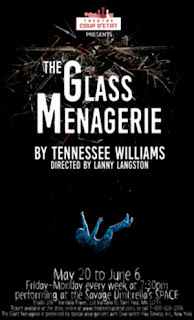 This is my fourth time writing about The Glass Menagerie on this blog, so I'm not sure I have any words left. Other than it's a classic of the American theater, one that hits close to home for me, and that speaks of hopes, dreams, expectations, regrets, and disappointments in a universal way through the playwright's specific story. This is a fine production with a strong cast and production elements that effectively create the tragic and nostalgic mood of the play (right down to the elevated temperature in the room). The Glass Menagerie continues Friday through Monday nights until June 6. With many theaters taking some time off for Memorial Day Weekend, this is a great option if you're staying in town and want to spend your holiday weekend seeing some theater (no better way to spend it!). *Plot summary borrowed from previous posts about The Glass Menagerie.